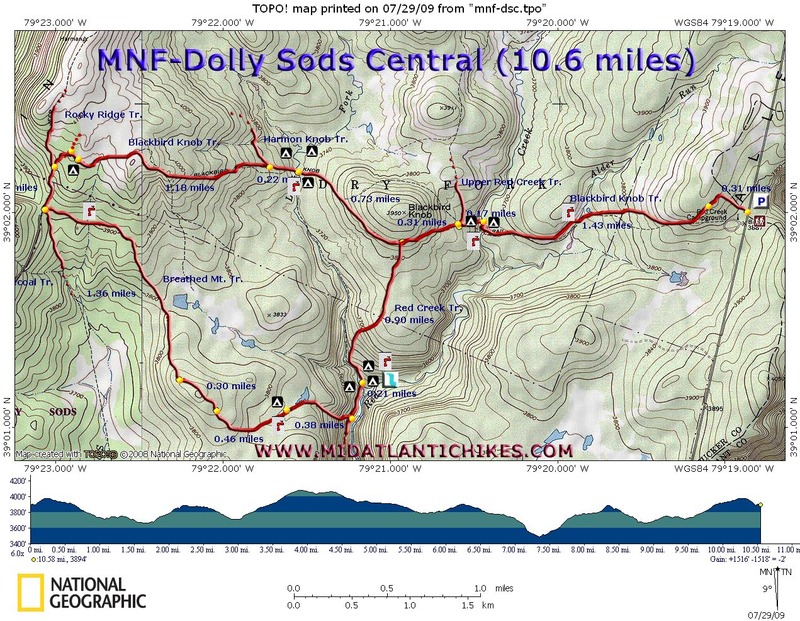 Description: This is a 10.6 mile moderate “spoon” shaped circuit through the heart of the Sods. You’ll walk through hardwood forest, Red Spruce forests and two pine plantations with open heath meadows in between. The focal point of the hike is an area called “The Forks” where the Left Fork and Right Fork of Red Creek come together. There you will find a giant swimming hole and a splendid waterfall. Although this can be easily completed as a day hike it may also make a good short over-nighter, especially for novice backpackers. 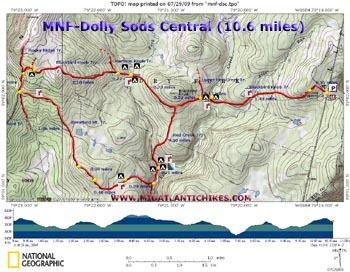 Total elevation gain is around 1400 feet. There are a total of six water crossings, four of which might be dicey during periods of high water. Many of the trails will be rocky, muddy or both, especially after a heavy rain. The hike begins at the Blackbird Knob Trailhead on FR 75 just north of Red Creek Campground. Look for the kiosk and boardwalk. Trail Notes: There are some signs but others have deteriorated or have been removed. There are no blazes. Still it is hard to get lost if you have a good map. Follow the boardwalk to its end. At 0.31 the trail splits. Follow the “trail” sign to the left. The trail will then break out into open meadows for a while before returning to the woods. Ford Alder Run. In 1.43 miles ford Red Creek (good camping in this area). Climb a short hill. In 0.17 miles from the ford pass Upper Red Creek Trail on the right. In another 0.31 miles pass Red Creek Trail (unsigned but marked with cairns). In another 0.73 miles ford the Left Fork of Red Creek (more good camping here especially upstream in the spruce grove on the east side. Once in the grove cross over to the west side for one of the largest sites in the area.). Climb up from the drainage. In 0.22 more miles pass Harmon Knob Trail on the right. Continue to climb for 1.18 miles. Pass a campsite on the left and an un-named trail on the right. Shortly after that Rocky Ridge Trail comes in from the right. Continue down a badly eroded jeep road for about 0.30 miles to a gray kiosk. The Big Stone Coal Trail is on the right of the kiosk. You want to take the Breathed Mountain Trail to its left. Cross a stream and in 1.36 miles from the kiosk pass through a plantation of very large pines. This might make for a nice campsite if you brought extra water along with you. In another 0.30 miles pass through a plantation of smaller pines. For 0.45 miles walk through mostly open heath meadows. Cross a stream and pass a nice but small campsite in the firs to the right of the trail. Descend for 0.38 miles to Red Creek Trail. It’s an obvious old railroad grade. Turn left and in 0.21 miles ford the Left Fork of Red Creek for the last time. “The Forks” is one of the most popular camping areas in the entire venue. Once you’ve seen the flat grassy area under the huge firs, the giant swimming hole and beautiful falls you’ll understand why. To continue bear left after the ford. You’ll follow the Left Fork for a while before climbing through some rocks to the first of several meadows connected by dense Spruce thickets. In 0.90 miles return to the Junction with the Blackbird Knob Trail. Turn right and retrace your initial steps back to the kiosk on FR 75.